"One full page dedicated to every puzzle and one of the few books I've found with this many 16x16s. Do you love the challenge of a tough puzzle? Then 16 x 16 sudoku might be the puzzle for you! This brand new book (now also available in volume 2) contains 50 fantastic 16 x 16 sudoku puzzles. 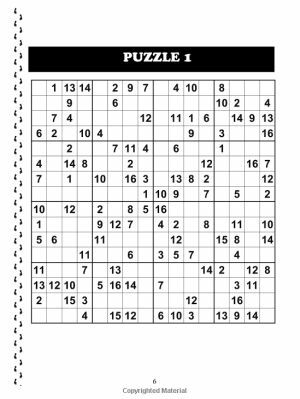 These puzzles will take you much longer to solve than normal 9x9 sudoku so you'll need patience and a systematic approach. To aid you in this, there is just one puzzle per page on a generously large page size so there is sufficient space for your pencilmarks on the page. Each puzzle has a grid displaying attractive symmetry. Just place the numbers from 1 - 16 once in each row, column and 4 x 4 box. There is no mix of numbers and letters about which can confuse: purely numbers. In this book of 16x16 sudoku puzzles, you can be assured that there is just one solution for every puzzle and that it can be reached through the application of logical rules alone, so you'll never need to guess. At the back of the book there are full solutions for every puzzle, so whether you want to check a solution and see if you got it right or need a little inspiration if you get stuck, everything you need is there. We hope you enjoy this collection of puzzles, which is available to buy now via the links below. For those who haven't yet tackled a 16 x 16 sudoku, they can look rather intimidating. So how do you go about tackling the puzzles in this book? Well the good news is that you will just need to use the simpler sudoku solving rules: there are no subsets to look at here which are very hard to track with so many numbers in each region: you will simply need to keep track of the options for each individual square and also keep track of where a number can go in a particular region, and use these two rules to solve the puzzles. As such, whilst the puzzles will be time consuming to solve as there are so many squares in each grid, they are all perfectly fair and won't require you to keep a huge number of pencilmarks: some people can actually solve these puzzles without using any pencilmarks at all, although in the majority of cases you will find them much easier to solve with pencilmarks so only try without if can solve the first few puzzles easily and want an even greater challenge! 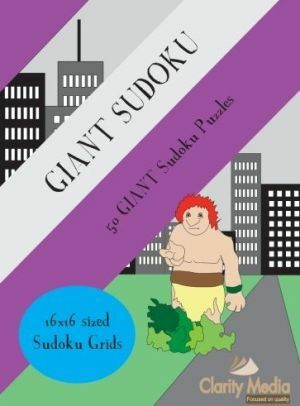 In summary, if you want a fun collection of 16x16 sudoku puzzles but want a fair selection that won't require you to look at sets of numbers and various intersection rules, then we hope these volumes of 16x16 sudoku will be just what you are looking for. If you have any comments and ideas, either on 16x16 sudoku, or other books that you would like to see published, then please just let us know - it would be great to hear from you!